February 1912. Port Royal, South Carolina. "Bertha, one of the six-year old shuckers at Maggioni Canning Company. Began work at 4 a.m." View full size. 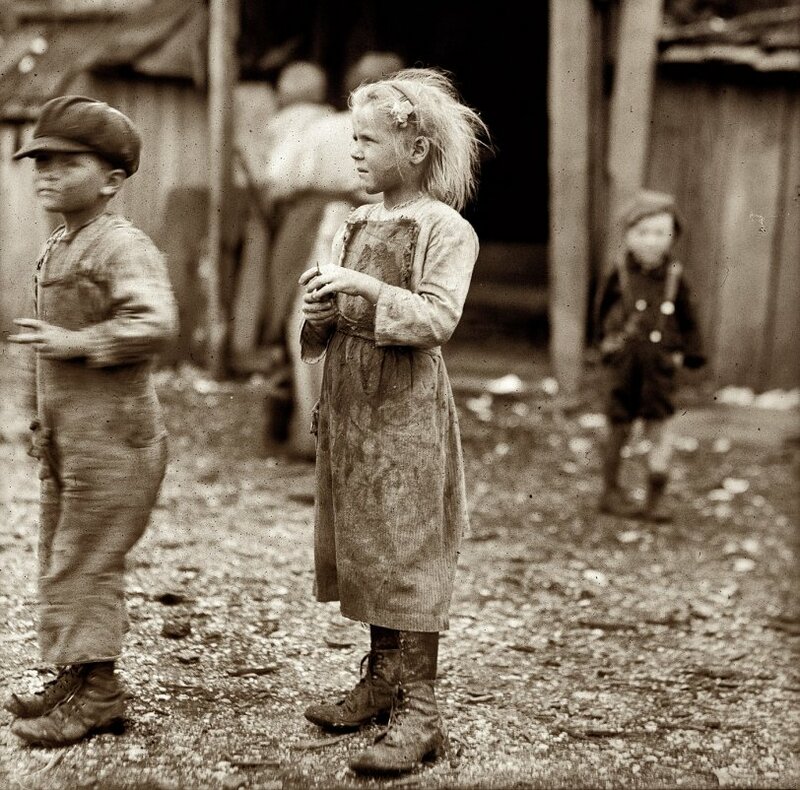 Photograph (glass negative) and caption by Lewis Wickes Hine. Submitted by C Gallington on Wed, 01/14/2009 - 10:28pm. I surely agree with your statement, I live on the other end of the state from you and do know what it is like to eat rabbit because I saw one out side my window one early morning when I was in a poor financial situation. I dread the future for the so many who do not know ow to provide for them selves. I am truly glad that my grand daughter or my children do not have to work this hard, but do fear we are going to see these times again way to soon. Submitted by Anonymous Tipster on Thu, 01/01/2009 - 8:12pm. As I look at your pictures, I fear for the younger generation. I am a great-grandmother of 5 and my grandchildren don't know how to cook unless it comes from a box. When things got tough, I knew how to make soap and washed clothes on a washboard. (Washing machine broke down.) No money to fix or buy another one for quite a while. No, I didn't live in "the hills." I lived in Kansas City, Missouri, and was in my early 30s. I have a college education, and know how to do what has to been done. The young people of today haven't a clue in regard to what to do if the lights go out and the heat goes off or what is edible or medicinal in regard to plants. Our children, grandchildren, great-grandchildren haven't a clue. Frankly, past years had their faults, but if the electricity goes off or the "boxes" disappear from the shelves, we are in a world of hurt. Submitted by maryann60004 on Tue, 10/14/2008 - 1:13am. I find it so poignant that the little girl has a flower in her hair, it is probably the only way she can identify herself as a girl. If you didn't see her head you would assume she were a little boy. I wish I could wrap her in pink. Submitted by mark on Thu, 03/13/2008 - 10:45am. I've seen a little of the so-called third world. While the United States has pockets of abject misery, most of those we consider poor here have a standard of living light years ahead of the rest of the world. "Back in the day" almost everyone worked long hours, with little rest or diversion. It was considered normal. I'm glad most of our children now have the luxury of enjoying life. Some of them, though, could stand the discipline and rigor of a little more responsibility. Perhaps a little less than what is pictured here. Submitted by Anonymous Tipster on Wed, 03/12/2008 - 9:31pm. And the kids today think they have it tough. This photo makes want to cry. Submitted by Anonymous Tipster on Fri, 02/22/2008 - 2:33pm. People who go on and on about the "good ol' days" should reflect. So haunting, even more so than the other shucker photos. Six. Years. Old. Submitted by tvshrine on Sat, 02/02/2008 - 10:12pm. This one really got to me. I have such an easy life.